Dentures are a common option for patients with missing teeth. Unlike permanent restorations (crowns, bridges, etc.) they are removable- you and take them out and put them back in. For most people, dentures take a little getting used to. They will never feel exactly like natural teeth. However, modern dentures are more natural-looking and more comfortable than ever. Most people won’t even know you are wearing them. 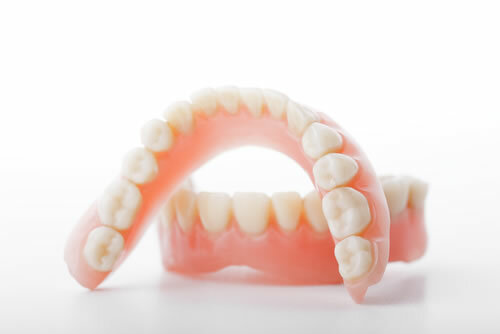 If you have already lost, or are about to lose, all of your teeth complete dentures are a great option for replacement. This type of denture is placed in your mouth after any remaining teeth are removed and tissues have healed. Healing may take several months and during which time you are without teeth. Partial dentures are an excellent way to fill in the gap between any teeth you might be missing. They rest on a metal framework that attaches to your natural teeth. Partial dentures snap into place and complete your chewing surface and smile. You can also choose immediate dentures which offer the benefit of avoiding going toothless for a while. A partial or complete denture is inserted right after your teeth are removed. The immediate denture is considered an interim denture because the bone supporting the teeth will often change shape as it heals, causing the denture to become loose. The final set of dentures are adjusted or remade to assure proper fit. It’s a good idea to have your dentures professionally relined every couple of years. You want to make sure they stay functional and secure. You should not need to use dental adhesives if your dentures were properly fitted and you take care of them. Most are held in place using saliva, the muscles in your mouth and through the natural contours of your gums and palate. However, the longer you have your dentures, the bone in your mouth can shrink which can cause them to become loose. Instead of relying on denture adhesive at this point, you should have them relined or have new dentures made that properly fit the mouth. Denture adhesives should only be used as a temporary solution. Also, prolonged use of ill-fitting dentures can lead to bone loss. Implant supported dentures attach to cylinders that have been surgically placed in the jaw. Many people find these to be more comfortable and a lot more secure, and the implants will help reduce possible bone loss. As a result, lot of our patients prefer implant supported dentures because of these significant benefits. You will have to allow time for the implants to heal into your bones, which can be several months. The results are often more than worth the wait. At Dentistry of Colorado, we will advise you which type of denture will best suit your individual needs. Set up a free consultation to to learn whether dentures are the best option for you. We have payment options, including our dental discount plan – the DENTAL ADVANTAGE PLAN. You can also finance your dental work with low or no interest through CareCredit. Contact us today, we can help you smile again!